I have no idea if all this is true or not, but it certainly appears to be true that the Bowling Museum had the picture of Luther at one time. The museum is no longer in St. Louis, it's in Texas. Brecht notes that "Luther had a bowling alley built for the amusement of his students in their spare time, and he occasionally participated in the game himself." 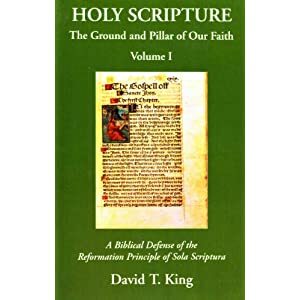 Addendum (ht: Carl Vehse): From a comment below, the quote in the pamphlet reads,"He [Luther] once preached a sermon which, if put into bowling vernacular, proclaimed we all strive for perfection in life. But if we roll a gutterball, all is not lost." So, the "quote" appears to be a loose paraphrase of something Luther is alleged to have said. Weimarer Ausgabe (Weimar Edition): D. Martin Luthers Werke: Kritische Gesammtausgabe (Dr. Martin Luther's Works: Critical Collected Edition), Briefwechsel (Correspondence), Volume 6: 199-200. Tischreden (Table Talk), Vol. 1, No. 261; Vol. 2, No. 1494. I had heard before that Luther was an avid bowler, but the idea that he had such an influence on the sport is a new one on me. I've been checking on that alleged "gutterball" quote from Martin Luther, and requested a copy of the brochure from the gift shop manager of the museum, now located in Arlington, Texas. I have been told the brochure contains a picture illustrating Martin Luther and a single bowling lane at the side of his home. My suspicion is that the alleged sermon quote ("strive for perfection in life. But when we roll a gutterball, all is not lost.") may be mythical, just as Luther's famous "wise Turk" nonquote (http://www.patheos.com/blogs/geneveith/2012/08/luthers-wise-turk-quote-that-he-didnt-say/) or the inkwell Luther threw at the devil (or vice versa). First, that brief quote doesn't sound very much like something Luther would preach. He viewed sin as much worse than rolling a gutterball. Second, in Luther's time, the game of bowling was usually played outside, used nine pins, and did not have a "gutter" on either side of the lane, so "gutterball" (or its German equivalent) was not likely a term used in Luther's time. 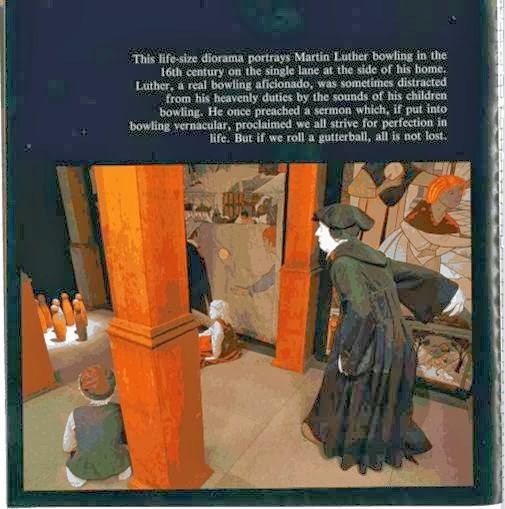 I received from the International Bowling Museum (IBM) a scanned copy of the page from a 1990s bowling booklet about Luther and his alleged bowling statement. Note the emphasized difference from the supposed quote provided in the article above. This nonquote about rolling a gutterball can be filed as "another quote Luther didn't say." Included in Here I Stand: A Life of Martin Luther (Roland H. Bainton, Abingdon-Cokebury Press, 1950, p. 131) is a woodcut image, Hutten and Luther Bowling against the Pope. The woodcut comes from a Reformation tract printed in Augsburg in 1522. The German word for bowling, "Kugel," is in the sixth line of the text with the woodcut.